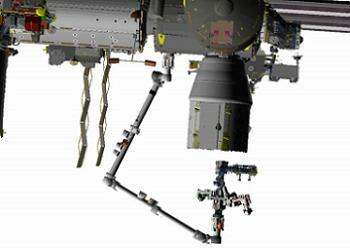 Planners within the ISS program have manifested the next two Commercial Resupply Services (CRS) missions. Both Orbital’s CRS-1 (ORB-1) and SpaceX’s CRS-3 (SpX-3) missions were initially provided with the same orbital place-holder in December, prior to this week’s decision to allow Cygnus to fly ahead of Dragon, with the latter moving to NET January 17, 2014 berthing date. The Orbital/SpaceX CRS tag team are a requirement element for helping the International Space Station (ISS) cope with the loss of the Space Shuttle’s superior upmass capability. Cygnus is currently preparing for its first trip to the orbital outpost, via its ORB-D mission that will complete numerous test objectives, not unlike those undertaken by Dragon during its COTS 2+ opening flight to the Station. Should Cygnus – and its launch vehicle, Antares – pass their COTS objectives, Orbital will move the duo into preparations for the opening CRS mission, known as ORB-1. Discussions have been taking place over the past several months pertaining to the launch and berthing opportunities for this second flight of Cygnus to the Station. While the international Visiting Vehicle schedule provides each spacecraft with only a small number of windows during the year, Cygnus’ potential conflict was with the next SpaceX Dragon, which had slipped its launch date into December. With Dragon slipping into a launch slot close to Cygnus, one of the CRS missions would have to make way, resulting in the loser slipping into early 2014. That decision has now been made. Per Flight Planning Integration Panel (FPIP) information provided to L2 on Tuesday, Cygnus – providing the ORB-D mission is successful – will now have a berthing window ranging from December 11 to January 10, 2014. 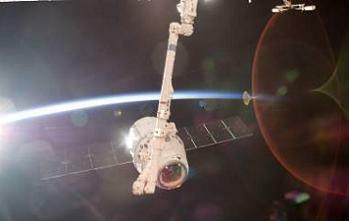 As a result, SpaceX’s CRS-3 Dragon will now target a berthing window ranging from January 17, 2014 through February 16. The SpX-3 flight will carry a full launch and return complement of 1,580kg/3,476lb of payload, an increase from the previous limit of 800kg afforded by the increased upmass capabilities of the Falcon 9 v1.1. 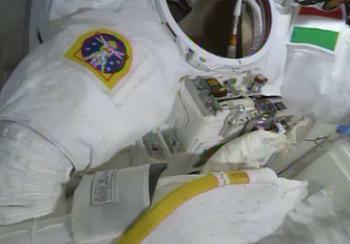 For return to Earth, Dragon will carry two GLACIERS, and also, in a recent addition to the manifest, the leaking Extravehicular Mobility Unit (EMU) spacesuit worn by Luca Parmitano during the terminated US EVA-23 on July 16. The EMU failure investigation team wish to return the EMU to Earth in order to carefully analyze the suit to determine the root cause of the leaking water which is being considered a serious safety issue by NASA. According to L2 information, a special rack has been designed to fit inside Dragon, which will safely hold the EMU during Dragon’s re-entry and landing. However, with SpX-3 launch delay, the NASA teams will now have to wait until March next year to be able to take a look at the leaky EMU. Also launching on SpX-3 will be two external payloads, which will mark the first time that Dragon has carried external experiments for the ISS. The first of these two payloads is the Optical PAyload for Lasercomm Science (OPALS), a JPL-designed experiment designed to test laser communication from the ISS. 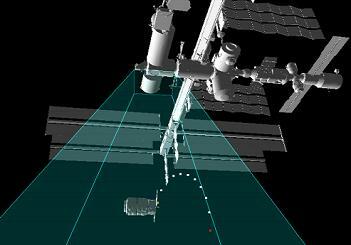 OPALS will not be used to downlink any actual data from the ISS, but rather will downlink test data residing inside the experiment itself to a ground station at JPL’s Optical Communications Telescope Laboratory (OCTL) in Wrightwood, California. This will test precision laser pointing and tracking technologies, in order to allow for much faster optical communications on future spacecraft, as opposed to the current Radio Frequency (RF) comms. OPALS will be mounted on a Flight Releasable Attachment Mechanism (FRAM) adapter plate, which are standard mounting platforms found on many locations outside the US segment of the ISS. They provide mechanical, power, and data couplings between the ISS and attached payloads, and are able to be installed both robotically and by spacewalkers. Interestingly, rather than being produced by NASA contractors as Government Furnished Equipment (GFE) as is usually the case, SpaceX have built the FRAM for OPALS themselves, meaning that SpaceX hardware will actually become part of the ISS for the duration of the OPALS mission. OPALS will be removed from Dragon’s trunk by the Special Purpose Dextrous Manipulator (SPDM) “Dextre”, and installed onto ExPrESS Logistics Carrier-1 (ELC-1) on the Port side of the station’s Truss, where it will remain until it is disposed of on the SpX-6 flight in January 2015. The second external payload launching on SpX-3 is the High Definition Earth Viewing (HDEV) package, which is comprised of four commercial HD video cameras which will film the Earth from multiple different angles from the vantage point of the ISS. The footage will be made available to the public via the internet for use in any variety of purposes, while also demonstrating and testing the use of commercial HD cameras in the harsh environment of space. 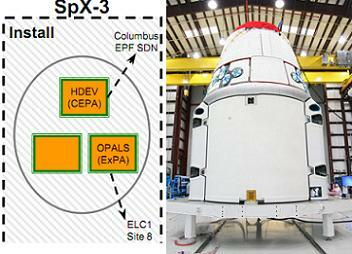 Like OPALS, HDEV is also a FRAM-type payload, although the FRAM for HDEV was not produced by SpaceX, as it is of a different type, since HDEV will be installed onto the European Columbus module’s External Payload Facility (EPF), again using the SPDM.